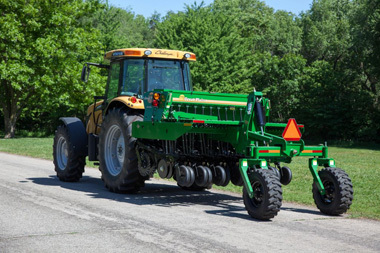 The Great Plains 3P806NT and 3P1006NT are No-Till Drills and are 2-Point Mounted with lift assist wheels to ensure safe operation and transport. 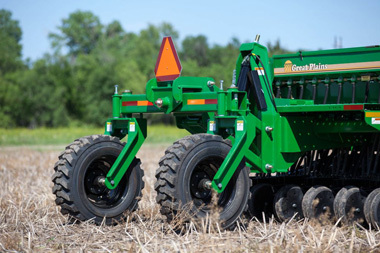 Plant up to three different seeds, at separate rates with lift assist wheels, at the same time with our 2-point mounted 10′ (3.05m) no-till drill with lift-assist wheels. They utilise the 06 Series Openers to properly place seed. The coulters are pre-loaded to 450lbs. (204kg) to ensure proper penetration, even in the toughest conditions. 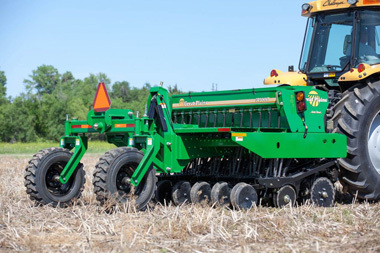 The spring pre-load coulter design adds stability and improved tracking on slopes. 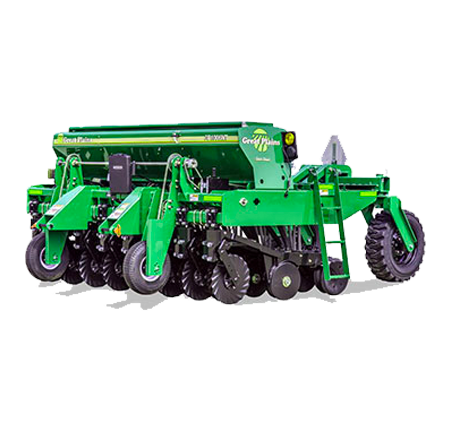 Our double disk configuration and full length seed tube ensures that the seed is placed consistently at the chosen depth. Additional seed tubes are used to place both native grass and small seeds. This allows three different seeds to be planted at separate rates and different depths at the same time. Depth control is handled by the 18-position T-handle press wheel adjustment. Coulter blade is our exclusive 5/8″ (16mm) Turbo blades. The main seedbox is a fluted feed design. 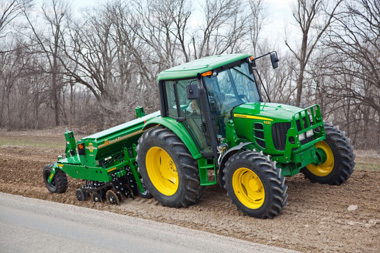 The seeding rate is set with the 4-speed transmission and the adjustable gate opening. The native grass box which is standard on our machine uses our proven “picker wheel” to meter the seed. Rates are adjusted by varying the speed of the drive. Lastly the small seeds attachment which is also standard is a smaller version of our fluted feed system, and seeding rates are set by changing the opening of the fluted feed. The ground drive system automatically disengages when lifted, simplifying the unit and enhancing its reliability. Two standard lift assist wheels in the rear of the 3P806NT & 3P1006NT provide greater lift capacity and assist the tractor’s 3-point. Straddle axle caster wheels provide manoeuvrability and strength. 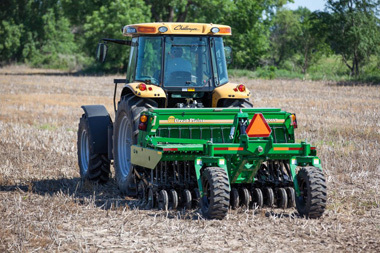 The 06 Series Row unit by Great Plains utilises the “Fluff and Plant” no-till system with an integrally mounted coulter to cut residue and prepare a mini seedbed for the trailing double disc opener. Opener discs are 13.5″ (34cm) in diameter with 4mm thick blades, 205 triple-lip sealed bearings, and 1/4″ (19mm) opener disc lead. A unique seed tube design and trailing flap control the seed all the way to the bottom of the seed trench where the seed stays in place. 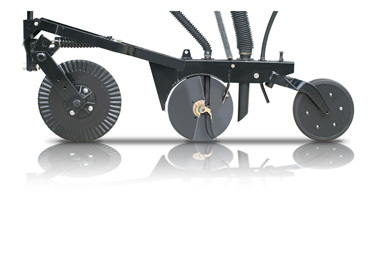 Pre-loader coulter springs offer 405lbs (204kg) of down pressure per row on the leading coulter with a range of 90 to 180lbs (41kg to 82kg) of consistent down-pressure on press wheels.